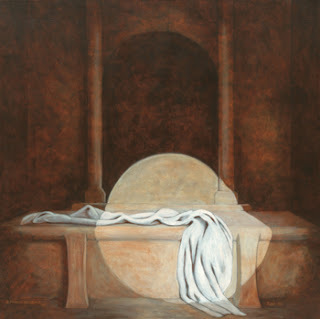 On this Easter morning, when the temperatures are not what we expect for April, I am reminded of that first morning when the Disciples arrived at the tomb of Jesus. It was no the day that they expected! Jesus has triumphed over the grave! Help us to accept everything that we hear from your Word this day, O Christ. Help us to believe, help us to live. Thank you for the empty tomb, and thank you for this day. Even if it isn't the day that we expected. We had a good amount of snow up in Erie this weekend. It didn't dampen our Easter Spirit. There was nowjere to sit in church today...definitely unexpected but awesome. He is risen! He is risen indeed! I always like to remember that the days where nothing "unexpected" happens, are usually not the ones we remember forever. It's the unexpected part where "life" happens and where memories are created! Just as "THE" Easter Sunday was a day that the disciples will never forget, this snowy cold one with family will stick with me too. What a joyful day we had at College Hill yesterday! More than I expected. The Spirit of God was present in the children, the singing, and the entire congregation! Thanks God, for a great day.